On Isaac: MATTHEW MILLER suit, PRADA turtleneck, and DR. MARTENS boots. On Laurie: YOUNG LOVERS CLUB shirt and pants, and CONVERSE sneakers. Left to right: FRED PERRY polo shirt and talent’s own pants and belt. FRED PERRY polo shirt and talent’s own pants and belt. The optimist is the ultimate likeable character; nothing can keep him from his path. If he is somehow prevented from reaching his goal, the optimist will take a different route, not wasting any time with worry or useless regret. 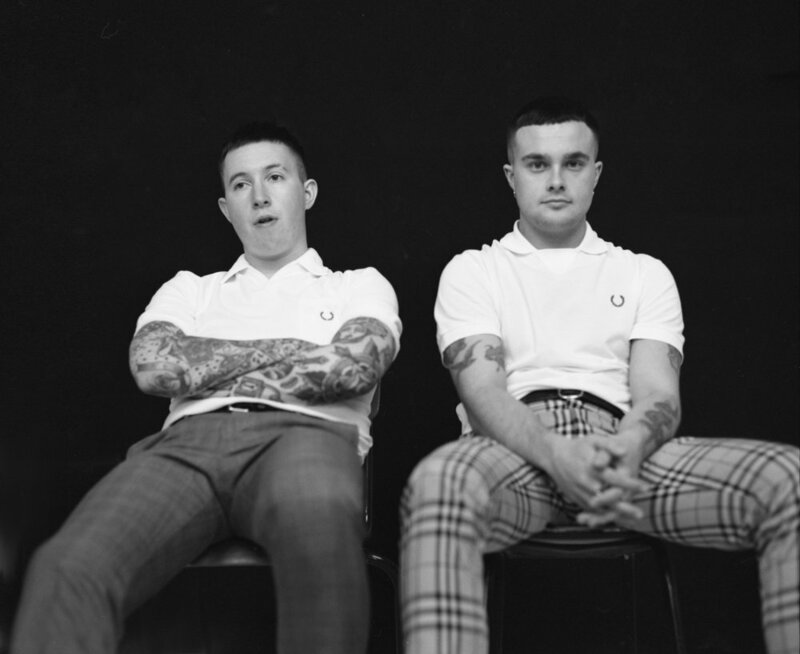 Upon first listen, London-based duo Slaves— comprised of guitarist Laurie Vincent and drummer Isaac Holman—might not sound optimistic. Vincent’s guitar is so crunchy, you’d think it was coughing to its death, and Holman’s drums sound as if they were fashioned out of trashcans. But keep listening. The optimism is there. Last May—after their cover of Skepta’s “Shutdown” for BBC Radio 1 went viral—the duo were criticized for their name, which many felt was inappropriate for two caucasian men. Vincent responded, “There are days when we think, ‘Oh man, why did we pick this name?’ But now I look at it, it’s important. It says a lot about the time we live in that freedom of speech is so overanalyzed that you can’t even use words.” It’s no coincidence that Slaves’ most jarring single to date is entitled “Cheer Up London,” the bridge of which goes: “Cheer up, London/It’s not that bad/Cheer up, London/You’re already dead and it’s not that bad.” See the optimism? Through and through. What was a good time when you were a kid? LAURIE VINCENT: Playmobil brought me a lot of joy growing up. I was really into the knights more than anything. I remember getting a really cool castle with a dungeon that had a dragon in for a very early birthday. I’d set up scenes with my Playmobil like a fight scene then stand back and feel proud of what I’d done. I wasn’t the kind of kid that took two toys and pretended they were fighting each other. Is your music comical or tragic? LV: Comedy is something humorous; tragedy is something heartbreaking and awful. Our band has comedic elements but our music is primal. Hard hitting, powerful, thought provoking, and fun are things I associate our music with. The world is about to end. What song are you listening to? LV: “Perfect Day” by Lou Reed. I think it would be an epic soundtrack to the apocalypse. I’d lie back and accept my doom to his dulcet tones. How do you have fun while on tour? How do you deal with homesickness? LV: You can’t plan fun. Fun is something that just arises when everyone is in a good place/mood or equally: when you are tired and miserable out of your mind and laughter is the only thing that can pull you through. Our ultimate idea of fun is getting on stage with our instruments and playing live music. Guaranteed fun every night. The crowd and the city are what change the parameters of the type of fun. Homesickness is a hard one; I usually just end up trying to get my girlfriend to come meet me wherever I am on tour eventually. We never last more than a couple of weeks apart. Groomer: Johnnie Biles for Frank Agency Using American Crew and M.A.C Cosmetics.